“In The Course Of This Story, And Very Soon Now, It Will Be Necessary To Make Some Disclosures About Mr. Krupper Of A Nature Too Coarse To Be Dealt With Very Directly In A Work Of Such Brevity. The Grossly Naturalistic Details Of A Life, Contained In The Enormously Wide Context Of That Life, Are Softened And Qualified By It, But When You Attempt To Set Those Details Down In A Tale, Some Measure Of Obscurity Or Indirection Is Called For To Provide The Same, Or Even Approximate, Softening Effect That Existence In Time Gives To Those Gross Elements In The Life Itself. 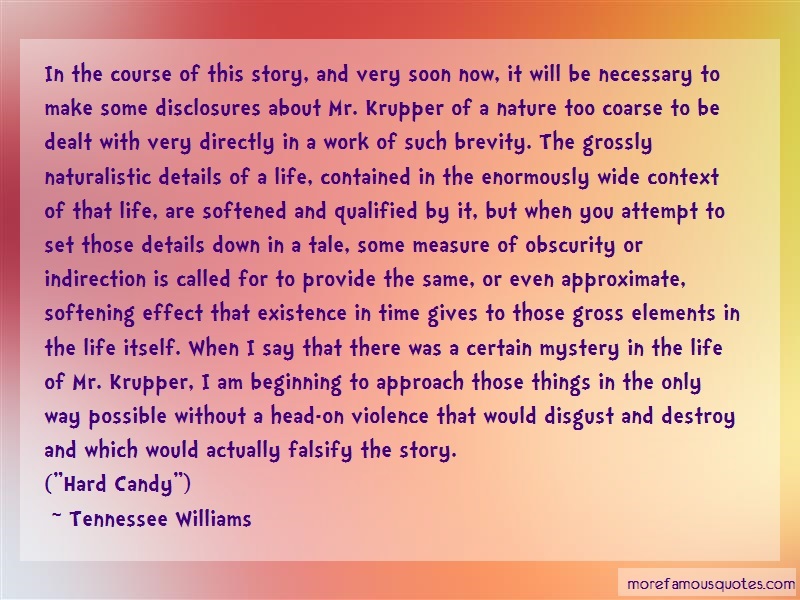 When I Say That There Was A Certain Mystery In The Life Of Mr. Krupper, I Am Beginning To Approach Those Things In The Only Way Possible Without A Head-on Violence That Would Disgust And Destroy And Which Would Actually Falsify The Story.